and then surround our code in Html.fromHtml() this causes them html styling to modify our text. 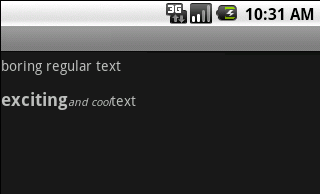 Below shows a screenshot of the regular styling and the html styling in an android application. In addition to the text styles(like bold n italic), can we get the list types like bullets and number types.Is there any chance to get the numbers and bullets by adding the respective html tags. Thanks very much. This is the only Gridview I got working now. How to make a textview have a justified alignment ?? i’m sorry my english not good..
Muito obrigado Exatamente onde são seus dados de contacto no entanto?